Raw chocolate. Glossy, snappy, creamy, and aromatic. The flexibility of chocolate is what I love most about it. It can be incredibly satisfying to simply taste a little piece of dark chocolate and let it melt on your tongue. However, it can be equally satisfying to taste an elaborate and boldly decorated raw tempered chocolate bark. I think that Linnaeus was dead-on when he named the cacao plant Theobroma Cacao, or “Food of the Gods”. I have been a chocolate lover ever since I can remember. 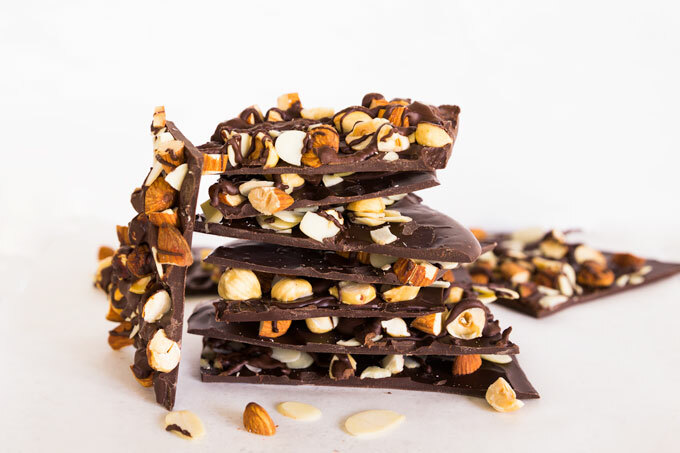 My obsession started with Bounty bars, then switched to peanut butter cups (check out this healthier version), and has eventually arrived at the basics – simple dark chocolate. Along with natural peanut butter, dark chocolate is one of the things I crave quite frequently. It tastes good. It smells good. And it feels good when it melts on the tongue. According to science, letting chocolate dissolve slowly in your mouth produces as big an increase in brain activity and heart rate as a passionate kiss—but the effects of the chocolate last four times longer! No wonder it’s so darn hard to stop eating chocolate. What really helped me tame my chocolate cravings was learning to make my own chocolate. The expensive ingredients not only made me think twice about how much chocolate I ate, but the higher quality usually satisfied the quantity I craved. So it was a win-win. Raw chocolate is made from cocoa beans which haven’t been roasted. Cacao and cocoa might sound similar, but both of them are unique when it comes to taste and nutrition. Cacao powder is the purest chocolate you can consume because it’s raw (although that’s questionable depending on where you get the cacao powder from). Roasting changes the molecular structure of cocoa beans, reducing the enzyme content and lowering the overall nutritional value. Cacao, on the other hand, is made by cold-processing unroasted cocoa beans and removing the fat – cacao butter. Cacao butter is what gives chocolate its unique mouth-feel and stable properties. It’s essentially the only fat present in “real” chocolate. Since cacao butter can form six different form of crystals – and only one of them produces firm and shiny chocolate – it’s what makes working with raw chocolate so tricky. The last ingredient necessary for making raw chocolate is a sweetener. Whenever I make raw desserts, I almost exclusively use liquid sweeteners, such as maple syrup or brown rice syrup. However, I’ve learned that liquid sweeteners don’t work all that great for tempering. (I wrote about why I don’t use liquids in chocolate here). So what’s the alternative? Powdered sugar. And by powdered, I mean powdered. No granules. Since chocolate is fat-based, granular sugar will not dissolve in cacao butter. So unless you grind the sugar to a fine powder, you’ll end up with that texture in your chocolate. I’m not gonna go into detail about tempering chocolate because I’ve written a whole guide on this topic already. But essentially, to temper chocolate you need to heat, cool, and then gently heat chocolate to precise temperatures in order to propagate a type of stable cocoa butter crystals. This allows the chocolate to have a mirror-like shine when set and results in the proper mouth feel and audible snap when you break off a piece. 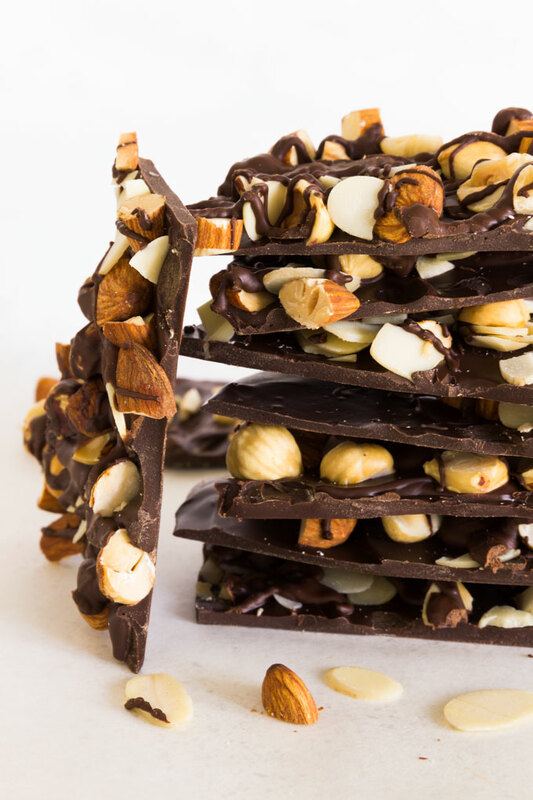 Very versatile raw chocolate bark that is tempered so it doesn't melt in your hands. Perfect for healthy eaters and chocolate lovers. Using a high-speed blender or a coffee grinder, process the coconut sugar into a fine powder. Coconut sugar crystals don't dissolve in cacao butter so grind the sugar into a very fine powder. Sift the powder if needed. Once your cacao butter is melted, mix in the coconut sugar and raw cacao powder. Keep stirring the chocolate to bring the temperature back down to 81°F (27°C). If time is an issue, you can also use an ice bath to speed up the cooling process. To make sure that your chocolate contains as many type V crystals as possible, heat the chocolate up to 88°F (31°C). Make sure that you stay below 88°F (31°C). Now your chocolate is tempered. 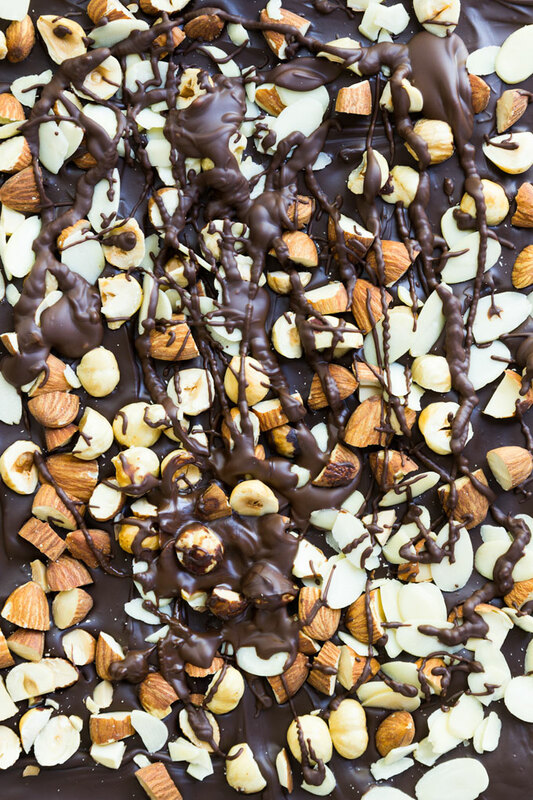 To make a chocolate bark, pour the tempered chocolate onto a piece of parchment paper. Smooth it out with an off-set spatula (make it as thick or as thin as you like). Finally, top it with the chopped nuts and craisins and let it set at a room temperature. Store any leftovers in a cool, ,dry, and dark place, ideally in an airtight container. Avoid storing in the fridge to prevent condensation on the surface. *If the idea of melting cacao butter over direct heat scares you, feel free to set up a double broiler consisting of a stainless steel bowl that sits on top of a pan of simmering water. Just be careful that not even a single drop of water comes into contact with the cacao butter and later on with the chocolate mixture. **Pour any leftover chocolate into molds. Tempered chocolate contracts when it sets, so it will easily come out of any mold you cast it in. I tried to make chocolate this way and it was not a success by me. I didn’t realize that the first step (melting) was going so fast. Even when I took the pan from the heat before 36 degrees Celsius, it continued heating up above 36 degrees Celsius (to 46 d.C) and not all cacao butter was melted. The second step (cooling) was going so slow. So I tried to put the pan on the ice cubs and it shocked the chocolate, so it turned up partly to a hard mess. And third step (heating) was going again to fast. It was really hard to control the temperature. Maybe you have some tips for me? And how can I reuse my messed chocolate? Thank you. Hi Ira – I can relate so much to your comment. All of this happened to me before as well. So here are my tips. The first step is the trickiest – what happened to you is completely normal. Since the pot is hot, it keeps heating up the chocolate even when you take the chocolate off the heat. What I do is take the chocolate off the heat when the chocolate is at about 40 C, keep stirring it (so the heat from the pot gets distributed evenly throughout the chocolate), and measure the temperature constantly to monitor how fast it’s going up. If it doesn’t quite reach 46 C, I put the pot back on the stove for a few seconds (no heat), stir it, and measure the temperature again. I have to say that the more often I make tempered chocolate, the less I have to monitor the temperature because I have a feel for how long it needs to heat it up. For the second step, I never ever use ice cubes. I simply wait till the chocolate cools down. I know it takes time, but I usually do other tasks and wait till it gets to the temperature I need it. Ice would definitely shock the chocolate. As I write in my “How to Temper Chocolate Guide“, chocolate doesn’t like to be shocked. Anything cold will make the chocolate grainy, and turn it instantly into a hard, solid lump. I hate to say it, but tempering chocolate definitely does take practice. I know it’s annoying when you waste expensive ingredients (and chocolate ingredients are particularly expensive, I know!) but I promise – the more often you temper chocolate, the easier it will get because you’ll get a feel for it. I tried to make the chocolate again and it was a success! This time it was easy to control de temperature exactly as you told. The chocolate was hard and snappy at the end, but not shiny. It was mat. Maybe because I melted the cacao butter to 43 degrees Celsius because I wanted to keep it raw. What do you think? Awesome! That’s so good to hear Ira! Did the chocolate have any bloom or was it just not shiny? I am asking because even properly tempered chocolate (that snaps and hardens) will have a slightly matte finish unless it was in contact with something that would make it shiny, like acetate. What did you use for the chocolate? What do you mean by using acetate? In which step? I used just ingredients you described in the recipe. I used also raw nuts as a stuffing. Hi Ira – I am sorry, I should have been more clear. Acetate sheet is a thin plastic sheet perfect for making chocolate. You essentially need a shiny surface to spread the chocolate on to get a really shiny chocolate. The shine will ONLY occur when the chocolate hardens against a shiny surface. I should have included this info in the actual post. I just felt like it would be too much information but perhaps other people are wondering about the same thing. I hope this helps and as always – let me know if you have any questions. Thank you so much, Petra! It’s very clear now. I have a quick question. Have you ever tried using the chocolate for raw desserts? Could I pour this over a cold raw cheesecake or is it going to through off the chocolate’s chemistry? Hi Marian – a great question! There are a few things to keep in mind. First of all, properly tempered chocolate sets rock hard so it’s not ideal for anything that is too large. However, it can make an excellent icing by stirring into the tempered chocolate up to 10% by weight of a neutral, tasteless oil. This is best added by very slowly pouring it in behind the baffle. A note: the oil can’t be cold (ideally around 30ºC). The chocolate “icing” will set with a tempered chocolate sheen, but with a softer texture. Another thing you mentioned is cold cheesecake. I wouldn’t recommend using tempered chocolate for raw cheesecake because cheesecake needs to be stored in the fridge. As you guessed, the cake should be at a room temperature before being iced. Also, to protect the finish, the cake shouldn’t be stored below 10ºC/50ºF – a normal refrigerator is not suitable. If you need to store the finished cake below 10ºC/50ºF then I would transfer it to a cool place for an hour before exposing it to room temperature. If the difference between the cake and the environment is greater than 10ºC/18ºF, it’s likely that a condensation will form on the cold surface. I know it’s a lot of information, but hopefully this helps 🙂 Let me know if you have any other questions. I am happy to help. I tried this and pour it on a baking sheet, it looks amazingly shiny but doesn’t get harden, how long should I wait for it? Does it take a long time or should I be worried? I want to add a full milk powder to make milk chocolate. But I don’t know how much it has to be. If I use 50 g cacao powder and 50 g coconut sugar, then how much do I have to add full milk powder? I also want to make white chocolate. What do I have to do for that? Hi Ira – I will have to disappoint you. 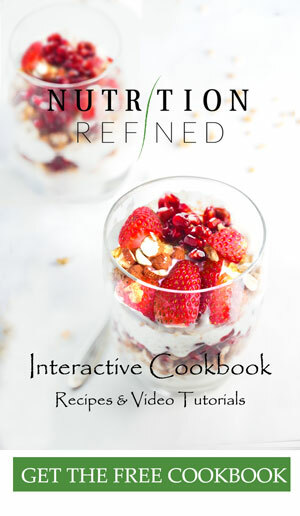 I am currently working on a FREE cookbook for my subscribers where I will be sharing recipes (with instructional videos) for raw chocolate, pralines, bonbons, white chocolate, etc. All vegan (raw but tempered) recipes. I will make the cookbook available for download in March so I don’t wanna share those recipes until then. I am so sorry to disappoint you. But you are on the right track – for milk chocolate, you will just need to add milk powder (I use coconut milk powder for vegan chocolate). White chocolate is a little bit more complicated because coconut sugar doesn’t work here (unless you don’t mind caramel-colored “white” chocolate). I will have a list of possible sweeteners for white chocolate in the cookbook. Amazing news! Can’t wait to buy your book! Hi Patty – tempering is tricky, that’s for sure. I would love to help though. Can you give me a little bit more detail about what happened? The chocolate shouldn’t be granular. If it is granular, the sugar probably wasn’t finely powdered. Sugar doesn’t dissolve in fat. So if the sugar was a bit granular before you mixed in with the other ingredients, the chocolate would be granular as well. Is that what happened? Also, if the chocolate isn’t hardening at a room temperature, it means that it went out of temper. This happens when you heat the chocolate too much (either the first time or the second time). If it’s not tempered, you will have to re-temper it all over again. The chocolate isn’t ruined though; it just isn’t tempered. So that’s not the end of the world 🙂 Let me know if you have any questions. I am here to help! I am just wondering whether I could use unrefined icing sugar in place of coconut sugar? 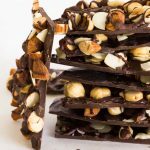 I have a coconut allergy so that is not an option for me unfortunately but I would love to have a go at tempering chocolate to make bark. I currently make raw chocolate using maple syrup, but don’t temper it and hence tend to keep it in the fridge! I was wondering if i could change the ratios of the ingredients bij using more cacao powder and/or less sugar. Or will this cause the chocolate to not be able to set properly? Thank you! Today I ve tried your Flaxseed Wraps and the Chocolate Bark. The Wraps turned out well, but a little bit small. I like the taste. But I m really proud of my Chocolate! It is great. I ve read your comments very carefully and the chocolate is shiny and taste really good. Unfortunately my processor is not good enough to mix the coconut sugar so fine like yours. But its ok, for the first time, I m very happy! I will definitely try more of your recipes! Hi Anna – thank you so much for your kind words! Your comment means more than you know ❤ I am so happy you like my recipes. That’s so awesome that the chocolate turned out so well. If it was your first time tempering, wow! That’s amazing! I definitely failed the first time I attempted to temper chocolate (but fortunately, I had great instructors who guided me through it 😉 The metric measurements – I should have had them on my blog right when I started posting recipes. I just never thought about it (since I always use cups and spoons here in Canada (unless I’m working with chocolate, lol). I am glad they are helpful 🙂 Thank you once again for your comment, Anna! you are amazing. I tried your recipe, super easy – couldn’t believe that I have tempered chocolate. Thank you very much for the recipe, I made my first batch of tempered chocolate with this recipe last night, and it went well, and has made a good hard shiny chocolate! Im making another batch now and waiting for it to cool, my only issue is that it’s going completely hard as soon as I put the coconut sugar and cacao powder in. It’s at 34 degrees right now and is completely solid. Last night I managed to spread it but works out looks a bit messy. Could this by any chance be the conversion? Just thinking that you mentioned your using imperial and I’m using metric, and that the conversion given is from volume to weight? I’m just hoping that once it’s cooled and I heat it again that I will be able to pour it at 31 degrees if I’m careful ! Hi Finlay, I don’t think the conversion is an issue. Are you using the metric measurements from my blog? (I assume you are, but just checking). I actually always use metric measurements when making chocolate because it’s more precise than using cups. You know, I am actually thinking that for some reason your chocolate seizes. The reason I say that is that when chocolate seizes, it gets really hard (seized chocolate becomes rock hard as it sets). Are you by any chance introducing any water into the chocolate (using wet utensils or mixing bowls, steam getting into contact with the ingredients from melting cacao butter, etc.)? Or are you adding ant liquid ingredients directly into the chocolate (extracts, liquid sweeteners, etc.)? Perhaps you could email me a photo of the chocolate – I think I would be able to tell right away if it’s seized or not. Can you tempere raw chocolate without loosing nutritional value? Hi Greg – the tempering temperature doesn’t exceed 115°F (46°C), which is still considered raw (and safe in terms of losing nutrients). However, your concern is valid. Whenever you heat food – even if it’s just slightly (or even when you expose food to light, oxygen, or a certain degree of acidity – also called pH), you do lose nutrients. It’s inevitable. Fortunately, the amount you lose is rather insignificant. Hey Petra, this is my favourite chocolate recipe I’ve come across and cannot stop combining it with your paleo vegan brownie recipe! But I was wondering what the calorie count is for the chocolate on its own, and it combined with the brownie. Do you have any idea or ball park number? Thanks so much for sharing your recipes online, can’t wait to try more!